See how I got all Nancy Drew there? Next, magic happened. I grabbed a stick of butter, browned it up, and tossed it back in the fridge to solidify overnight. While that butter was browning, I did a quick google search and soon learned that I had not invented science. But, whatever. No one was going to rain on my brown butter parade. Truth be told, I’ve tried to brown the butter in just about every recipe I’ve ever made. Sometimes on purpose, sometimes not. I’m actually a little embarrassed that it hadn’t occurred to me to do this until now. If browning butter scares you, don’t be scared. You make toast, right? Just imagine you’re toasting butter, it’s pretty much the same thing. When butter melts it separates into water (which evaporates), butterfat, and milk solids. The solids sink to the bottom of the pan and get all warm, toasty, and down right delicious. Add that magic to tangy cream cheese and BOOM, science. Sweet, tart, nutty, delicious brown butter cream cheese frosting! Use it as a cake filling, soft finish, sandwich cookie filling, or cupcake frosting. Add the unsalted butter to a sauce pan over medium-high heat. 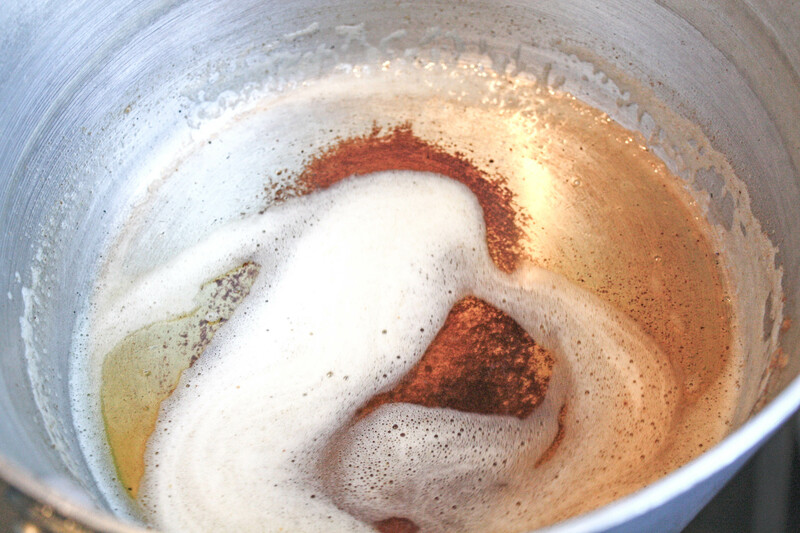 Swirl the pan as the butter melts to keep the milk solids moving on the bottom of the pan. Don't walk away at this point! The butter is going to go from blonde to brown very quickly. You'll know the butter is done when you see little brown bits on the bottom of the pan, as well as floating around in the butterfat. The smell will also change, going from a light buttery aroma to something similar to the smell of roasting nuts. Once the butter has browned, remove the pan from the heat. Pour the browned butter into a shallow heatproof container or onto a lined sheet pan. Using a rubber spatula, scrape every last little brown bit of heaven out of the sauce pan. THAT is the magic. If you leave the brown bits behind 20 minutes will have been wasted. Frankly, we couldn't be friends at that point. Place the butter in the fridge and gather the rest of your ingredients while it sets up, about 20 min. Once the butter is firm, scrape it into the bowl of a stand mixer fitted with the paddle attachment (or into a medium sized mixing bowl if using a hand mixer). Beat the butter until it's lighter in color and completely smooth, about 5-7 minutes, stopping to scrape down the sides of the bowl with a rubber spatula. Cut the cream cheese into cubes and add it to the creamed butter along with the vanilla extract and salt. Mix on medium until the mixture is combined and no cream cheese lumps remain, just about 3-4 min. Stop half way though and scrape down the sides of the bowl, because you will be very upset with yourself if you get to the end of this flavor party and there are lumps in your frosting. With the mixer on low, slowly add the confectioner's sugar until completely combined. Use the frosting right away or store it in an airtight container for up to 3 days in the fridge. This sounds amazing! Is this firm enough to frost cupcakes with? Yes! You could definitely pipe the frosting with a big round tip, or spread it on with a small spatula. I don’t think it would be firm enough for a star tip or anything that needs to hold a shape though. Thanks for asking! Great question. Yes! You can freeze cream cheese frosting for up to 3 months. Just let it thaw in the fridge overnight before using. Thanks! think you love cream cheese frosting? This is WAY better! Sometimes it never makes it to the cake. Thanks, Erin. Oh my goodness this is delicious! I think you’ve ruined me for any other frosting ever. YUM! Can I top a pumpkin cheesecake with this? And add the cute pear turkey legs?